The African Bush Elephant can weigh up to 5.5 tonnes, making it one of the largest mammals alive! 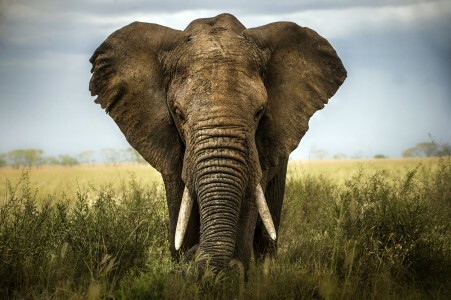 Also referred to as the Savanna Elephant, the African Bush Elephant is only second to the Giraffe in terms of height! Previously thought to exist as one species (the African Elephant), both the African Bush Elephant and African Forest Elephant were discovered to be two different subspecies. The Bush Elephant is larger, a lighter colour, and has outward curving tusks, whereas the Forest Elephant is smaller, very dark and has downward facing tusks. Where does the African Bush Elephant live? The African Bush Elephants habitat is given away by its name – in the African Bush! This includes savanna grasslands, partial desert areas and primary forest within Central and Southern Africa. These locations are perfect areas for the African Bush Elephant to find food. An ideal meal for the African Bush Elephant consists of plenty of grass, fruit, and roots. They spend most of their day eating, as they need to consume a large amount to consume sufficient calories for their large bodies. Leaves and branches are stripped off trees using their powerful trunk, and their tusks can be used for digging and for scraping bark. African Bush Elephants have flat teeth specifically designed to break down and help them digest plant matter. Do African Bush Elephants have to watch out for predators? Not particularly. Due to their immense size, weight, and social grouping, they are rarely preyed upon! However, young elephants can sometimes be targeted by lions and hyenas if they stray from the group. When surrounded by large females, predators won’t take the risk. Are African Bush Elephants social like other Elephants? Yes, in fact all Elephants are social and live in similar matriarchal societies. This means that they are led by an older, more experienced female, and females stick together whilst males leave the group once sexually mature. As nomadic animals, they are constantly travelling together to search for food and keep their young safe from predators. Elephants are incredibly intelligent animals, capable of showing emotion and remembering information. To read more on their behaviour check out our Elephant page. How do African Bush Elephants cope with the heat? By using their trunks! They fill their trunks with water and spray it over their young in the hotter months, and frequently visit watering holes. Muddy spots can also be used for cooling down. African Bush Elephants that live in the Sahara or Namib deserts are also known as Desert Elephants, but are otherwise the same as those that live in the grasslands. What threats do African Bush Elephants face? Although population levels are recovering, African Bush Elephants face many threats including habitat loss and poaching. Similar to other species, loss of land reduces the availability of food and water, meaning they have to travel further. What’s worse, some won’t survive the journey if they cross paths with poachers. African Bush Elephants aren’t just killed for the illegal ivory trade, but they are often the victims of conflict with local people too. What can be done to help African Bush Elephants? Give them room to roam! A possible solution would be to provide wildlife corridors that allow the African Bush Elephant to travel without coming into conflict with people. The African Wildlife Foundation combines governments and communities in Africa and works to set land aside for this purpose. Similarly, education that encourages people to understand the African Bush Elephant can change perceptions and reduce local hunting pressure. The African Wildlife Foundation also recruit ‘wildlife scouts’ that act as rangers to monitor populations and illegal activity. You can help this cause here! Learn how to be an Ethical Elephant Tourist Here!